On weekends, Lori and I like to take one afternoon/evening and cook. We’ll cook for ourselves, or for friends, or family; it doesn’t matter who, just so long as we can have fun in the kitchen. We’ll open a bottle of wine and get to work, with one of us having come up with the menu early enough so that we could get the necessary ingredients. The twist on that last Saturday night is that we went to a cooking class, where the menu for the night was Moroccan food. (We brought our own bottle of wine.) And the class upped the ante by pairing Moroccan food with the most famous movie set in Morocco, Casablanca. Chicken phyllo rolls with spicy tomato sauce at Pans on Fire cooking class. Chicken tagine on the stove at Pans on Fire cooking class. Chicken tagine ready to eat at Pans on Fire cooking class. The nine of us in the class got to help with all the dishes. Some of the class was learning techniques: better knife skills, how to dice an onion, how to preserve lemons (a great alternative to lemon juice in recipes). Some of the class was just hands on work: shredding the chicken for the phyllo rolls, prepping and rolling the phyllo rolls, getting the spices and other ingredients ready for the tagine, making the Ghoribas dough. The best part of the class was eating our work, and watching the movie. We broke up the movie watching with the kitchen work, about 1 ½ hours of initial work, followed by the first half hour of the movie, then another 30 minutes of work on the tagine, followed by another half hour of movie watching, then the final kitchen work and the final bit of the movie. About 4 hours in total. As I was choosing the wine, I thought about the Moroccan spices we’d be using, and not so much about what the meat would be. Moroccan food, which evolved because of its geographical/historical position in the world (on the Spice Route, Mediterranean Sea, Africa), typically uses bold flavors like cumin, coriander, turmeric, cinnamon, red chilies, and ginger. We needed something that could stand up to the spices, in both flavor and body, but not overwhelm them. Pinot Noir would likely be too subtle; Cabernet Sauvignon, Zinfandel and Syrah too big. 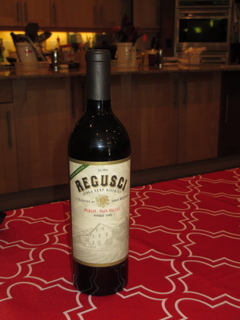 A softer GSM (Grenache, Mourvedre, Syrah) blend would work, but then I found a great candidate in the cellar: 2006 Regusci Merlot, Stags Leap District of Napa Valley. Lori and I are pretty sure this was a gift from our friend Phil, so thank you Phil. (We ought to do better about cataloging our cellar, but there you go, other priorities.) It worked great, as anticipated, and was our mama bear wine: not too small and soft, not to big and bold, but just right. Linda Wyner, the fearless leader of this class, has an interesting background. She’s a food anthropologist, lawyer, cook, teacher and founder of Pans on Fire. What the heck is a food anthropologist? The Anthropology of Food is an analysis of food in culture. While the primary purpose for food is nutrition, it also has a cultural dimension by which people choose what they eat not only by flavor or nutritional value but by cultural, religious, historic, economic or social status, and environmental factors. From Archeolink.com. Well, that makes sense, and sounds like fun. Maybe some food anthropologist will look at our blog in future years as a treasure trove of information. Not! The last surprise here? I’ve now written about Merlot twice (here’s the first post) in a 2-week span. This entry was posted in food and wine and tagged cooking class, Merlot, MerlotMe, Moroccan cuisine, Pans on Fire, Regusci on August 11, 2014 by vvblogman.